The government guaranteed facility will form part of the financing of Eskom's current capital expenditure programme. The power utility's Group Chief Executive Phakamani Hadebe said significant progress has been made in securing funding. "We have made significant progress in transitioning the business and securing funding. 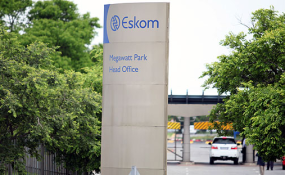 We are pleased that lenders have elected to continue partnering with Eskom on our journey to complete the capital expansion programme for the benefit of South Africa's economy," said Hadebe on Friday. "To date we have raised and secured approximately 95% of the R72 billion funding requirement for financial year 18/19; the remaining 5% will be raised through various funding sources including domestic debt capital markets. "The stable liquidity position places us in a position to focus on securing funding for the next financial year (financial year 19/20 of which 30% has already been secured)," he said. The utility's Chief Financial Officer Calib Cassim also responded to a request by the Nersa panel on the impact of Eskom's performance on the application on the first day of public hearings in Gauteng. "I must emphasise that the two applications are developed in accordance with the regulator's prudency guidelines and are based on the MYPD methodology decisions and reasons for decision on previous applications. "Firstly, we maintain our RCA application as our assumptions remain unchanged. We have made proposals on liquidation of the RCA balance to be undertaken in same period as NERSA liquidation for RCA for years 2015 to 2017," he told the panel. Speaking at the public hearing held in Soweto Theatre on Friday, Cassim said sales forecast, Regulatory Asset Base (RAB) and production planning assumptions including primary energy and capital expenditure have changed but the operational expenditure has not changed on the utility's MYPD4 application.